I’ve been sharing lately, a little at a time, the journey on which God is leading our family since we announced the closing of our church. But for those of you who admire my transparency, you should know: I shared those things mostly because I had to. There was nothing in me that wanted to look into the faces of our leaders, and later our entire congregation, and say, “We’ve been praying about it, and we are going to close the church.” In the days leading up to each of those hard meetings, I was plagued with so much fear. The multitude of reasons a church closes, and how little of that constitutes failure on the part of the pastor is conversation for another day, but I will admit that in those moments, closing our church felt very much like failing. And failure, especially big, public failure, is quite literally the stuff of my worst nightmares. I actually joked with Jason about quietly sneaking away from Ozark in the middle of the night, and just never showing up again. In all honestly, that probably would have been my preference. But if I had done that, if I had refused to face up to the fear of disappointing people and the painful end of dearly held dream, I would have missed out on so much good that God had for me. I mean that from the bottom of my heart. The love and encouragement and tangible sense of God’s presence in our living room as we met with our leaders was like nothing I had expected. It was like I was expecting to be pelted with stones and instead found myself wrapped in a warm hug. The unexpected gift of that one moment bolstered me to face the others that would come: telling our parents, telling our church, cleaning out our building, having our last service, saying goodbye, and walking into the unknown. So in retrospect, I’m glad I had to walk through that broken suffering publicly. I’m glad I was forced to let other people in, to let them know what was going on with me. But despite how surprisingly good all of that vulnerability ended up being for me, I’ve kept so many other things close to my heart, afraid to bring them out into the light and really be honest about how I’m struggling, and what God is teaching me. I’ve alluded to it a handful of times, both here and on Facebook, but I haven’t been very public in sharing the fact that I faced some significant health problems over the last year. I told myself I was quiet about my health because it seemed like with everything else going on in our lives, it seemed like too much negativity to heap on people. But mostly, it was because I didn’t want to admit any more weakness. Next to failing, my next biggest fear is needing help. That looks ridiculous now that I’ve typed it, but it is true. I like being able to do things for myself, by myself. I do not want to have to rely on others. If I can always be the one giving, helping, serving, then I don’t have to admit my own neediness. I couldn’t have articulated any of this a year ago, but through the things I’ve faced over the last year, the Lord is revealing to me more and more areas where I need to grow in trusting him and let go of my self-reliance. And lately, I’ve felt like the Lord saying it is time to be transparent about more of the brokenness the Lord has invited me into. About a year ago, I had this nagging cough that wouldn’t go away. I coughed and coughed all day long. It was “just a little tickle” I kept assuring people, even when I couldn’t catch a breath, or when tears were streaming down my face. The thing was, I didn’t feel sick. I didn’t have any other cold or allergy symptoms. Just this ridiculous cough that was starting to draw curious looks from strangers. So finally, after talking it over with Jason (and making several paranoid late-night internet searches), I called my doctor. “Is this normal?” I asked. He assured me it wasn’t. He could, but it took a lot longer than they thought it would. I breathed into machines and sat under others while they took pictures of my lungs. They tried first one prescription, and then another. But instead of getting better, I was getting worse. Now I did feel sick. I couldn’t walk or talk for more than a few minutes without getting winded, and I perpetually felt like someone was sitting on my chest. I moved more slowly throughout my day and sat down more often when we went for walks. I often couldn’t muster the strength to make dinner at the end of the day. I found myself saying, “No more books, buddy. Mommy’s voice is too tired.” Sometimes, even sewing in front of the TV in the evening felt like too much work. It was a level of weakness I was unaccustomed to. And I was surprised by how unsettling it was for me. On top of dealing with obvious fears like “what is wrong with me?” I found myself terrified of my weakness. All of a sudden, I needed A LOT of help. Around the house. With my kids. I was relying on others to do the things I was sure I should be doing myself, and I didn’t like it one bit. Thankfully, by October, the doctors had determined I had asthma. I had a whole host of new tubes and bottles and inhalers in my medicine cabinet, but I was getting better. By December, after a couple more adjustments to my medications, I was basically back to normal. I was thankful and relieved to feel like myself again. But it wouldn’t last for long. Once I finally worked up the courage to begin writing this story, the words came so fast and fierce, I knew almost immediately that this was going to be too long for just one blog post. So stay tuned next week for part two of this story. Our hearts are full today, our last Sunday with you. Before, we thought we have might have a lifetime to share our hearts with you. But now, as we prepare for one last chance to speak to you, it doesn’t seem like enough. We have so much left to tell you. It is no secret that we think of you as our third child. We have spoken at great length about the labor it took to bring you into existence and the way you required more from us than we even knew was in our power to give. But we have also made known the rewards we found in serving you, our deep love for you, and the pride that swelled in our hearts in moments when we glimpsed just how far you had come. How do we say goodbye to you now? Our building on 20th Street has never been, in and of itself, our church. So even though we may shed some tears when we close the doors for the final time today, it’s not the building that we grieve. It is your precious souls, the group of us together, and knowing that we may never all be gathered together in the same way this side of heaven that makes us weep. Come this afternoon, the Lord may begin to scatter us all in different directions, to new fellowships, new ministries, or new callings. But for now, while we remain together, may we remind you of a few things that are dear to our hearts? Remember that true worship of God always takes our eyes off of ourselves and our own circumstances, and focuses instead on His greatness and majesty. Don’t underestimate the power of this simple act. When God came to Job in the whirlwind, He never answered Job’s questions, He just reminded Job of how big He was (Job 38-41). We would do well to remind ourselves often of those same things. Remember that the best and truest way to discern God’s voice is to immerse yourself in His word. Any other great endeavor requires extensive dedication, training, and discipline. How much more so the immense task of following Jesus? It is not legalism to work hard at learning the stories of the Bible, their context, and even memorizing their very words. The Holy Spirit can only remind us of the things we have already learned, and we are privileged to hold the very words of God in our hands, so endeavor always to learn them as well as you can. Remember that aside from the Holy Spirit, the best help you have in following Jesus is those who are walking with Him alongside you. Growing together will not happen on accident, and there is power in praying with and for each other. Remember that following Jesus is not something you only do on Sunday mornings. This world is not our home, but rather we travel through it as ambassadors of Christ everywhere we go. Remember that Jesus told us we would be hated for following Him. Persecution was a catalyst for the spread of the gospel in the book of Acts, and still spurs on true followers of Christ around the world today. Remember that nothing is impossible with God. We don’t always understand His ways, but He is never powerless to help us. Remember you are the shepherd of your children’s hearts. While your pastor and church should come alongside you as you commit raising your babies in the fear of the Lord, those little ones’ first and most influential spiritual leader is you. Remember that the gospel is a message of reconciliation. This means we should seek to be reconciled to God, but also to one another. Never leave a church in anger or with unresolved conflict. “If it is possible, as far as it depends on you, live at peace with everyone” (Romans 12:18). And above all else, remember the greatest promise of the Bible is this: God with us. Nothing can separate us from His love (Romans 8:38-39). No matter where we go, His presence goes, too. It has truly been a joy and honor to know and serve each of you. You’ve been posting a lot of stuff on Facebook lately about what’s going on politically in America. And if you’re sharing articles or lengthy posts, I want you to know I’m reading them. I read what you share about guns and the gorilla. About immigrants and refugees. I read about Target bathrooms. About Obama and Trump and Hilary and Bernie. I read about who your pastor or Bible study author or favorite talk show host is supporting for president and why. I read about what Spurgeon said and what Bonhoeffer said. I read your careful exegeses and your Bible verses plucked out of their context and applied haphazardly to an entirely different situation. And I’ve been thinking a LOT about all these things you’ve shared. If you’ve been reading this blog for a long time, you know that I don’t really take a firm stance on much. I don’t care whether or not you breastfeed your kids, or teach them about Santa, or let them read Harry Potter. I didn’t come out publicly in support of a candidate for the 2012 elections, and I probably won’t do it for the 2016 elections either. Lately, I’ve been questioning why I do that. Mostly, I like to believe that it’s wisdom and self control that keep me from entangling myself in those arguments. There’s also a good chance that fear stands in my way. I don’t want to alienate or upset anyone. Truth be told, I want you to like me and what I have to say. But as to why I don’t share my opinions on these divisive issues, the most likely reason of all may be this: I don’t have the answers. I don’t know what the next president will face between 2017 and 2020, or how each candidate will respond. I don’t know when the Supreme Court will have empty seats that need to be filled. I don’t how the American church would respond under persecution, whether we would shrivel and wilt, or come out of the fire tested and pure and strong. I don’t know what will speak more deeply to the hearts of my friends who need Jesus: my compassion or my righteousness, though I pray I have both. I don’t know what tomorrow will bring. But I know the One who does. Why aren’t we going to Him for the answers? I know it’s hard. My tendency is rely on my wisdom and abilities, and closing our church has shaken me up and shown me all over again how small my trust and faith in my God is. I want to know right now what job He is going to provide for us. Where we will be living in 3 months. Where we will be going to church. Whether or not we will be able to afford for me to stay at home for another year. And some days it feels like not knowing those things is going to kill me. It won’t, of course. But it is breaking me. Remaking me into someone new. Someone who trusts God more deeply. Someone who is willing to be led by faith and not by sight. And that is what the church must be in these trying times. But we must also be people of prayer. “My message and my preaching were not with wise and persuasive words but with a demonstration of the Spirit’s power, so that your faith might not rest on men’s wisdom, but on God’s power” (1 Corinthians 2:4-5). Like I said, I’m reading the things you share on Facebook, but every day, I grow a little more convinced that a well-written post on why to boycott Target or not is not what the church or the world needs from us. I don’t know your situation. I don’t know what decisions you will have to make today, this week, this year. But I know that God will give you wisdom if you ask Him to. Please, let’s get on our knees about our own specific situations, and ask God, beg him, to show us what He would have us do. Let’s be people who are “quick to listen, slow to speak, and slow to become angry” (James 1:19). Let’s be people of prayer. Oh, my friends – where do I even begin? We announced a week ago that we are closing our church, and so many of you have reached out to us to find out how we are doing, and I haven’t quite had the right words to answer that question. The truth is, we are grieving. Deeply. Every week we discover a new painful part of this process, and the whole thing has just been plain hard. We’ve cried a lot and there is no easy band-aid to put on this pain. My God is in the business of redeeming what is broken. If you’d asked me a year ago what that means, I would have told you something that sounded really nice, probably using a mosaic as an analogy, how things can be more beautiful because of their brokenness. But now that I’m having to live that out, I’m finding out God’s redemption is so much bigger than I gave Him credit for. Closing our church is both more broken and more beautiful than I ever could have imagined. I ugly cry almost every day, and God’s grace is there, big in my big pain. God’s grace is there in friends who weep with us, holding us tighter than I would have ever imagined they would do. God’s grace is there in the prayers that poured forth in our living room night after night, sparking revival in our hearts. God’s grace is abounding to us. Friends, I didn’t know it could be like this. I knew in my head, theologically, that God is present in the midst of suffering. But the truth is, I think I secretly believed that God’s leading meant a win. That because he asked us to do it, our church couldn’t help but grow bigger and better all the time. And if I’m being really honest, I think I secretly believed that the people who had planted other churches that closed had missed God’s leading or disobeyed him along the way somewhere. That it couldn’t be God’s plan to lead someone into hardship. So just what are God’s plans for us? Most of us who have grown up in church know Jeremiah 29:11, about God’s good plans for us. But what does that even mean? If you back up a chapter, you will see that Jeremiah was prophesying to the nation of Judah during what was basically foreign occupation by the Babylonian Empire. More and more of the people of Judah were taken captive to Babylon, until Nebuchadnezzar’s puppet king, Zedekiah, rebelled, and the Babylonians destroyed Jerusalem in retaliation (see 2 Chronicles 36). The people of Judah had no context to process this large-scale punishment for their collective disobedience to God. They were sorry. They wanted to go home. Why wasn’t God hearing their prayers? Because of this, some prophets were saying that God would deliver them from the oppression of the Babylonians in two short years (see Jeremiah 28:2-3). After all, why would God have to reassure us that his plans were not for harm, unless it felt very much as if they were? And though we don’t like to talk about it much in the church, that is how walking with Jesus often is. We have taken verses like Jeremiah 29:11 out of context, and fooled ourselves into believing the gospel says “Come and prosper.” We want to believe that God is always leading us to places where we will be richer, happier, healthier, and more successful than we were before. But what the gospel of Jesus Christ really says is, “Come and die.” We don’t want to the Lord to lead us into places of brokenness and betrayal and heartache, but that is so often the road he asks us to walk. To know Jesus is to know suffering. The truth is, God does have good plans for us. But we have to let Him define what that good is. And we have to know that the fullness of the good He has for us will not be achieved in this life. Someday, we will be with Jesus, and he will wipe away every tear from our eyes. That is our future. And even now, in the midst of all we suffer in this life, He is ALWAYS with us. That is our hope. Jason and I are taking comfort in the far-off future we have in Jesus, no matter what the immediate future holds. We truly have no idea what is next for us. We have not had any job offers or interviews, but we have peace that God will go with us into all of our tomorrows. We are spending more time on our knees than ever before, and if only for that we are grateful for this season and how it drives us to seek more of God. Thank you to everyone who has been praying for us and taking time to encourage us along the way. We are humbled by your love! PS. I am indebted to many anointed writers and musical artists whose work God has used to speak to me over the last few months. If you are in a season of brokenness (or want to know how to encourage someone who is), I recommend The Hardest Peace by Kara Tippets, When God Doesn’t Fix It by Laura Story, and Hinds Feet on High Places by Hannah Hurnard. If you’re looking for music, what we have on repeat around here are The Glorious Unfolding by Stephen Curtis Chapman, As Sure as the Sun by Ellie Holcomb, Majestic by Kari Jobe, and How Can It Be by Lauren Daigle. Today is December 1st. The big meal and big deals are behind us. We started lighting advent candles at our dinner table two nights ago, and tonight, at bedtime, we will crack open a brand-new storybook that will carry us through these next 24 days, tracing the family of Jesus, the promised Messiah. “A shoot will come up from the stump of Jesse; from his roots a Branch will bear fruit. The Spirit of the LORD will rest on him–the Spirit of wisdom and of understanding, the Spirit of counsel and of power, the Spirit of knowledge and of the fear of the LORD–and he will delight in the fear of the LORD. “He will not judge by what he see with his eyes or decide by what he hears with his ears; but with righteousness he will judge the needy, with justice he will give decisions for the poor of the earth. He will strike the earth with the rod of his mouth; with the breath of his lips he will slay the wicked. Righteousness will be his belt and faithfulness the sash around his waist. “The wolf will live with the lamb, the leopard will lie down with the goat, the calf and the lion and the yearling together; and a little child will lead them. The cow will feed with the bear, their young will lie down together, and the lion will eat straw like the ox. The infant will play near the hole of the cobra, and the young child put his hand into the viper’s nest. They will neither harm nor destroy on all my holy mountain for the earth will be full of the knowledge of the LORD as the waters cover the sea. This is what the whole Old Testament has been leading up to, what all of creation itself has been waiting for since Adam and Eve took that very first bite of sin. This is where we place our hope, this Coming One, who will reconcile us to God and bring us peace. My advent devotional reading this morning asked where in my life I was longing for a tender shoot of hope, and I wanted to ask back, “where am I not longing for hope?” Two thousand fifteen has been, without question, the hardest year I’ve had yet. Truthfully, there’s a large part of my heart that would be willing to box up the tree and skip right over this season and right into a new year. This year has been a year of circling the story of Elijah. There’s the story of Mt. Carmel, when God answers Elijah’s simple but faith-filled prayer by sending fire from heaven. It is, to my mind, one the most astounding miracles in the whole BIble–this fire that burns up soaked wood and laps the water filling the trench beside it. But that’s not the story I keep coming back to. In the aftermath of that miracle, Jezebel threatens to kill Elijah, since he killed her false prophets. It is this story that I kept coming back to. “I have had enough, Lord,” I prayed in April. Then we put our dog to sleep. My son, who is about to start kindergarten, can’t stop having accidents. Attendance numbers at our church leave me feeling discouraged. My doctor can’t figure out why the medicine isn’t helping my asthma, and in the meantime, I can’t walk a block without getting winded. Hurt. Betrayal. Loss. Failure. Fear. Every single thing that happened, small or large, felt like the last straw, and I would kneel in my bedroom and read this story and pour my heart out before the Lord. Like the people of Israel waiting for a political Messiah to throw off Roman oppression, I want Jesus to come in big and loud and rescue me out of this mess. I want God to be in the mighty wind or the earthquake or the fire. But that isn’t how God appeared to Elijah, and it’s not how he appears to us. All year long, I’ve been begging God to come and change my circumstances. But instead, he offers to come in quiet and small, and change me. God did actually send literal fire down a number of times in the Bible. The time that comes most immediately to mind, at least for me, is Elijah’s showdown with the prophets of Baal and Ashtoreth on Mt. Carmel. Israel had embraced idol worship, and Elijah had prophesied a drought over the land as God’s judgment for their worship of the idol Baal (whom they believed provided them with rain, crops, and fertility). After three years, the land was dry and barren, and Elijah made king Ahab and his false prophets an offer: Let’s build sacrifices to our respective gods on the top of this mountain, but not light them. Whichever god answers our prayers with fire is the true God. They accepted, so Israel gathered at Mt. Carmel to watch the showdown between this one man of God and the 850 prophets who served the nation’s idols.The false prophets went first and called out to Baal for hours. They wept and wailed, and even cut themselves in an attempt to get his attention, but to no avail. “At the time of sacrifice, the prophet Elijah stepped forward and prayed: ‘Lord, the God of Abraham, Isaac and Israel, let it be known today that you are God in Israel and that I am your servant and have done all these things at your command. Answer me, Lord, answer me, so these people will know that you,Lord, are God, and that you are turning their hearts back again.’ Then the fire of the Lord fell and burned up the sacrifice, the wood, the stones and the soil, and also licked up the water in the trench. When all the people saw this, they fell prostrate and cried, ‘The Lord—he is God! The Lord—he is God! '” (1 Kings 18:36-39, emphasis added). Elijah asked, and God answered with fire. Not just any fire, either, a supernatural fire that burned up all the things we use to contain fire: water, soil, stones. It is this image that is often in my mind when I sing about fire falling down. But this is far from the only time that God sends fire in Scripture. God rained fire down on Sodom and Gomorrah. God sent a pillar of fire to guide the Israelites in the desert. God sent fire to consume the sacrifice when Solomon dedicated the temple in Jerusalem. And tongues of burning fire appeared over the heads of the believers in the upper room on the day of Pentecost. These are all instances of a literal fire coming down from the sky. And as I said before, I’m not sure that’s what we are asking for when we sing these songs. So what are we talking about? 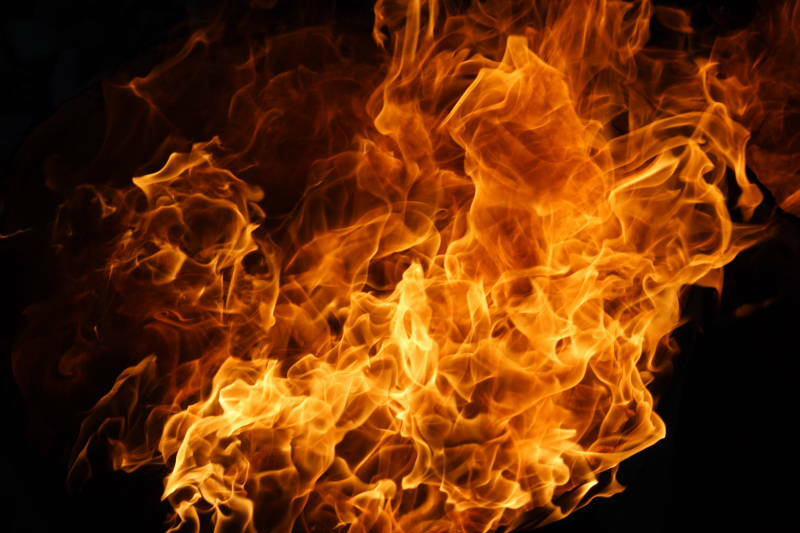 We should be careful to consider what the Scripture says about God and His fire. So often, in the church, I think we equate fire with zeal, as in “being on fire for God,” and some nebulous feeling of being excited about God. But the fire of God is much bigger than that. Want to hazard a guess at which book of the Bible mentions fire the most? It’s Leviticus, which is not a book we often enjoy reading or studying, but it can teach us a lot about what it really means to ask for God’s fire. In the book of Leviticus, God’s fire meant a few different things, and they are a pattern for what fire means throughout the rest of the Bible. In Leviticus, the people of Israel frequently turn away from God by grumbling, complaining, losing faith, acting irreverently, and turning to idols. In these instances, God often judged people for their disobedience, and on more than one occasion, the Bible says that fire came out from the Lord and consumed people (Leviticus 10:1-2, Numbers 11:1-3). Through Christ, we are no longer stand accused of our sins, but for those who reject Him, the judgment that awaits them is often described with images of fire and burning (as in Mark 9:43). By far, the majority of references to fire in the book of Leviticus had to do with sacrifice. Leviticus is all about instructions for the priests in their duties, one of which was continually offering ritual sacrifices on the altar before the Lord. The fire on these altars was supposed to remain burning at all times. Those who loved God continued to make burnt offerings to God throughout the rest of the Old Testament, and as I mentioned before, there were several occasions when God sent fire from heaven to show his pleasure for a sacrifice his people offered to him (Leviticus 9:24, 1 Kings 18:38, 2 Chronicles 7:1). Sacrifice looks a little different for New Testament believers. Jesus died once for the sins of the whole world. But that doesn’t mean that we don’t bring anything to offer to God; on the contrary, because God has done so much for us, we owe him everything. Paul says in his letter to the Romans, “Therefore, I urge you brothers, in view of God’s mercy, to offer you bodies as living sacrifices, holy and pleasing to God. This is your spiritual act of worship” (Romans 12:1). Another primary way that fire was used in the book of Leviticus was for ceremonial purity. Because God is holy, and cannot abide where sin is, His people needed to be set-apart and clean. A large portion of the book of Leviticus talks about what makes a person unclean, and how the Israelites were to purify themselves. Things that had touched disease, bodily fluids, mold, or had been in foreign possession had to be purified also, and anything that could withstand fire was usually purified that way (as in Numbers 31:23). In the New Testament, believers aren’t purified outwardly through ritual, but inwardly through obedience and submission to Christ. New Testament writers often remind us to be joyful in the midst of difficult circumstances, because they often purify our faith and draw us nearer to God. Peter calls these “fiery trials” (1 Peter 4:12, ESV) and Paul teaches, “We also rejoice in our sufferings; because we know that suffering produces perseverance; perseverance, character, and character, hope” (Romans 5:3-4). To me, the most significant thing that fire represents in the Bible was the very presence of God. In Leviticus, when they were setting up the tabernacle, God signified that He was with his people by appearing in their midst as a pillar of cloud by day and as a pillar of fire by night. And I don’t think it’s any coincidence that when God poured out His own spirit on New Testament believers that what they saw “seemed to be tongues of fire that separated and came to rest on each of them” (Acts 2:3). Asking for God’s fire is a big thing, but for those of us who are serious about forsaking ourselves and following after Jesus, I think it’s a wonderful and appropriate thing for us to ask from God. We just need to be mindful that when we sing and pray “fire, fall down” we are not asking for a warm glow of affection for God. We are asking for his blazing, consuming, awesome presence. We are asking for God to come as rightful judge. We are asking for Him to look with pleasure on the meager offerings we bring before Him. And we are asking for God to draw near to us in His fullness and to burn up everything in our lives that is displeasing to him so that we can know Him more and walk in closer step with Him. Eventually, we had this idea to bring in Christian artists and host a concert for them, giving them all of the proceeds, if they would agree to come and lead our worship night, where anyone could attend free of charge. Thinking back on this as an adult, I am astounded we got anyone to come. I can’t imagine those concerts were very lucrative for these artists. We were a small school and our biggest auditorium didn’t hold much of an audience to speak of, especially not if these artists were used to playing in big arena. But they must have seen our hearts or something, because some people came anyway, and led worship for us like we had asked. One of those nights, Todd Agnew came. I had heard his songs on the radio and was excited to hear him play for us, both at the concert and at our worship night, which was first. I had a really full schedule that semester, and hadn’t been around when some of my friends picked him up at the airport and got him settled at our school’s bed-and-breakfast-type inn. 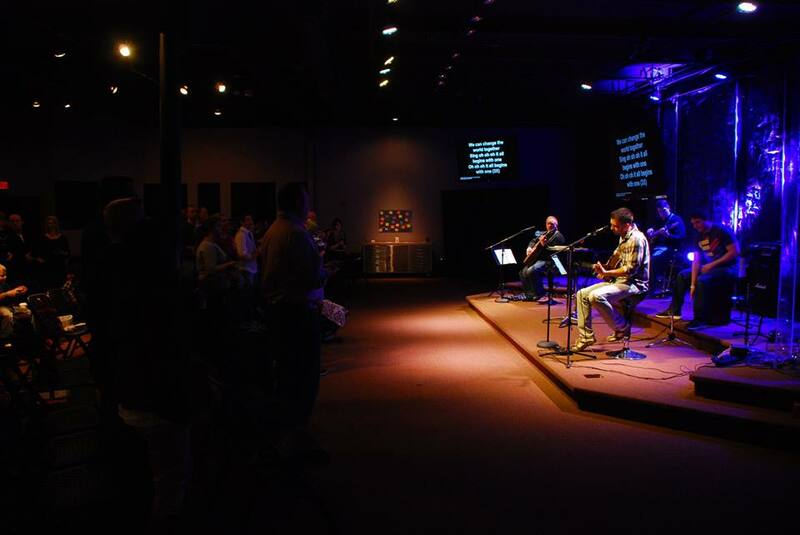 We had decided to have the worship night at the old cathedral on campus, because we were expecting a larger crowd than we typically had on an average Monday at the fraternity house. I had come from work and got there just as it was starting. I expected to see Todd Agnew up on stage, but the only stage lights that had been turned on were the ones behind him, outlining only a vague silhouette of a man on a guitar. And he proceeded to teach us about worship. He pointed to Jesus’ conversation with the woman at the well in John 4, where Jesus tells her that the kind of worshipers the Lord seeks are those who worship in spirit and in truth. Todd challenged us: how often do we sing words we don’t understand or words we don’t mean? If God wants people worshiping Him in truth, are we doing that? Those questions have stuck with me all these years, and I return to them often, evaluating the way I sing when I sing to the Lord and the lyrics of the songs I’m singing to Him. My favorite songs contain rich imagery and language taken directly from the Bible. But I also love songs that force me to stop and ask, “Do I really mean that?” Is God’s grace alone really enough for me? Would I really follow Him anywhere? Do I even know what I’m asking when I ask to see God’s face? I can’t answer that last question for you, but I can help with the first two. Studying worship lyrics has always fascinated me. As a teenager, I loved reading a passage of scripture and realizing it was the inspiration for a song I liked. And as I’ve gotten older, I have intentionally sought out the history and meanings behind songs that are a part of our tradition, from the most contemporary worship songs to the oldest hymns. I want to start sharing some of that information here. It’s so easy to get caught up in lyrics that sound good, or that are set to a nice melody. I’m guilty of that as much as the next person. So I thought we could spend a little time together examining the things we say in Christian songs, and what it really means to say to those words to our Lord, so stay tuned. But in the meantime, would you do this with me? Next time you go to church and sing worship songs, would you read the lyrics before you start singing–I mean really read them? Start asking yourself the questions above. What do these words mean? Do these words line up with the truth in the Bible, to the best of your knowledge? And most importantly, do you mean them?